The North Alabama area offers a wealth of attractions, outdoor activities and a diversity of outstanding golf. In addition to the Robert Trent Jones (RTJ) Golf Trail courses, there are others that warrant recognition. Family attractions such as the U.S. Space & Rocket Center in Huntsville, blend in with annual festivals and special events. Recently, GoGolfandTravel.com had the opportunity to visit the area to play some of the courses and check out a few attractions. This is a hidden gem for golfing and a vacation destination. A quick overview of the RTJ Golf Trail; built in the late 80's, it was the largest golf course construction project ever undertaken at one time anywhere in the world. 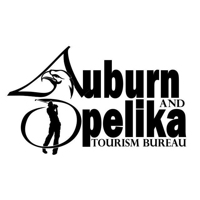 Today it offers 11 locations across Alabama, 26 golf courses and 468 championship holes. More about the RTJ Trail at: www.rtjgolf.com. Our first stop was the Twin Bridges course in Gadsden, owned and operated by the City. This par 72, 6,800 yard, 18-hole course was designed by Gene Bates and his group out of Palm Beach Gardens, Florida. Greeted by the general manager, the course features Bermuda fairways, bent grass greens and strategically placed bunkers. Twin Bridges is masterfully laid out along the Coosa River. Twin Bridges has several holes deserving a quick description. The number one handicap on the front is #5, a 554 yarder from the tips with three forced carries...or, make that two if you want to lay up your second shot to a 32 yard long green. To kick off the backside, you'll encounter the number two handicap hole at #10. This is a par 4, 434 yard layout from the tips, but you have water to the right of the hole from some 100 yards out up to a narrow green. This is a very nice course with reasonable pricing for both weekday and weekend play. Fred Couples is part of The Gene Bates design team that created Twin Bridges. The group has some impressive courses to their credit...to name a few: Circling Raven (Worley, Idaho), Hillwood Country Club (Nashville, Tennesse) and Corballis Golf Links, Dublin, Ireland. Bates was Vice President of Design & Construction Services for Jack Nicklaus Golf Services in the early 80's prior to opening his own golf course design business. What could be more fitting after a round of golf than a tour of the Back Forty Brewery nearby? This Craft Beer operation in Gadsden is one of the best in the South. It took some ten years for founder Jason Wilson to get laws changed, funds secured and facilities built to establish today's 27,000 square foot production plant. In June of 2009, Back Forty released its first offering called Naked Pig Pale Ale. In a little over a year the craft beer made such an impression, the second batch of Back Forty called Truck Stop Honey Brown Ale was offered to the public. The company recently has been awarded the "official craft beer of the Robert Trent Jones Golf Trail." Son, that's big in this part of the world! For information to take a tour of this facility and testing some of their products, or where you might find it in your neck of the woods, go to www.BackFortyBeer.com. Good golf, a couple of cool ones and dinner at Local Joes' at Little Bridge Marina on the Coosa River...it just "don't get any better." The barbeque was delicious, service great and the outdoor setting provided the end of a perfect day in North Alabama. The second round of golf in North Alabama was one of RTJ Trail's finest...the 36-holes at Silver Lakes at Glencoe is 12 miles southeast of Gadsden. Here we found three 9-hole courses that tests every golfing skill in your bag. These are appropriately named Heartbreaker, Backbreaker and Mindbreaker. Then, there is the Short Course, a 9-hole very challenging par 3 or sometimes called an executive course. In and around the Clubhouse of Silver Lakes, you'll find great amenities for any golf club. There are putting greens, meeting facilities, golf lessons, driving range, lounge, lockers, pro shop, snack bar, showers and a full service restaurant. We played all three of the "breaker" courses. The fairways were typically broad and allowed comfortable landing areas whether from the drive, second or third shots. Just about every green is elevated and many times offered a blind shot to the surface. Undulations are commonplace and expected on all holes...don't be surprised. This area of North Alabama has a gently rolling landscape and in some cases very steep and rugged terrain. This makes for longer stretches in fairways and demands at least one or two clubs when hitting second and third shots. Suggest you move up a tee when playing either of these layouts. From a golfer's standpoint, this is a perfect place for a challenging and enjoyable course. It features forests, wetlands, grasslands and some dramatic elevations. The backdrop of the Appalachian foothills and Lee's Lake, along with featuring Champion ultra-dwarf putting surfaces, makes this possibly the best on RJT Golf Trail. You'll want to return and play a second or third time on the Silver Lakes. For more information on this beautiful golfing facility go to: www.rtjgolf.com/silverlakes. Before leaving Gadsden, be aware of the Lookout Mountain Parkway, one of America's most colorful scenic drive. The Gadsden arts scene features museums such as Mary G. Hardin Center for Cultural Arts, Walnut Gallery and Gadsden Museum of Art. Some one and one-half hours north and west of Silver Lakes is beautiful 5,909-acre Lake Guntersville State Park. This would be our second night's accommodations and golf for the third day at Eagle's Nest. The lodge offers 112 rooms and suites, Conference Center and full-service dining facilities. What makes this location so special are the views of the 69,000 acre lake created by the impoundment of the Tennessee River. All hotel rooms and suites, include a mini-refrigerator and microwave, coffee and coffee pot, TV and DVD player (upon request at the front desk), iron and board and hair dryer. The lower level of the lodge offers a pool, fitness center, game room and saunas. Our group was afforded a sunset cruise on Lake Gunterville with dinner at SomeWhere. Yep, that's the name. It is one of those restaurants and bars that make living on or near a lake pleasurable. The food and beverage offerings are just what you want in an atmosphere of this type. SomeWhere's owner Morris "Bubba" Thurman, is an original "good ole boy" and makes all customer feel right at home. If you are visiting the area, don't miss it! Check out their website: www.somewhere2b.com. Located on top of Taylor Mountain and a very short distance from the Lodge is Eagle's Nest Golf Course. The clubhouse and many of the holes overlook Lake Guntersville. Jerry Pate was brought in to work with the Park in 2009. The course underwent some major renovations that included Dwarf Bermuda Tiff greens as well as a state-of-the-art irrigation system. With a somewhat mountainous terrain, the elevation allows for constant changes and challenges. The scenic beauty of this course along with spacious fairways and very fair undulating greens allow you to enjoy a course for all golfing skills. A couple reasons this course is so friendly, there are no water hazards on the course and only six holes have more than one sand trap. Many of the trees on the course were destroyed by a tornado that hit the park in April 2011. The staff is friendly and the clubhouse offers snacks, beverages and a selection of souvenirs. There's also a putting green and driving range to allow you to sharpen your game or warm up before your round. For more information, go to: www.alapark.com/lake-guntersville-state-park. Golf Advisor ranks Gunter's Landing course as the #2 "Courses to Play in Alabama" and #16 for "Courses to Play in the U.S."
Gunter's Landing and Buck Island are located on the southernmost point of the Tennessee River near the City of Guntersville and 30 minutes south of Huntsville. Golf Advisor ranks this course as the #2 "Courses to Play in Alabama" and #16 for "Courses to Play in the U.S." Those are strong rankings and probably one of our top two played on this trip. Every hole seemed to be as different as the previous. It is apparent the back nine was the original front nine. The handicaps on the current front nine are even numbers and the back are odd numbers. Interesting that both #1 & #2 handicap holes are par 4's. Hole 14 is 436 yards from the tips with sand traps guarding both sides of the green. Number 9 is the #2 handicap and stretches 444 yards with demanding two shots for making the large 33 yard wide green. Accommodation packages are available through the club. The cost for playing at any time is most attractive. The location is perfect for playing golf as it is located on a peninsula in a valley at the foothills of the Appalachian Mountains and offers vistas of Lake Guntersville from the course. During the winter months, this area is abundant with one of the largest American Bald Eagle nesting sites in the southern United States. For more information: www.gunterslanding.com. Cherokee Ridge Country Club presents one of the most beautiful courses on this trip. Some 10 miles northwest of Guntersville is Cherokee Ridge Country Club at Union Grove and also near Arab. Open to the public and presenting one of the most beautiful courses on this trip. They offer a seven bedroom Lake House with all the amenities you could want, perfect for families and golf groups. The home is in walking distance to the clubhouse for dining and checking in for golf. This is one of North Alabama's premier golf courses. There is a 17-acre lake on the front 9 and a 40-foot waterfall on back 9. Every hole is challenging and beautiful. From 1994 to 1998, Cherokee Ridge was the home for the Nike Tour's Alabama Classic. The number one handicap hole on this course is a par 4, 382 yards from the tips. It is the seventh hole with only one sand trap guarding the left side of an elevated green. There were other holes on the front nine that were difficult such as numbers 2 and 4. On the backside, the most difficult seemed to be the 10th hole, a par 5, 528 yards from the back with a large ravine in front of the green demanding a forced carry. It was listed as the 6th handicap hole. This was a most enjoyable course and one you will want to make return visits. Visit their website for more information at: www.cherokeeridgecc.com. This facility was one of the original group of courses opened on The RTJ Trail back in the late 80's. Since then, both courses have undergone renovations making improvements in both player friendly and overall aesthetics with the Highlands Course brought back to its original design in 2008. River course at Hampton Cove features water on 16 of 18 holes and is the only trail course with no bunkers. The clubhouse is one of the most impressive of the 11 locations. 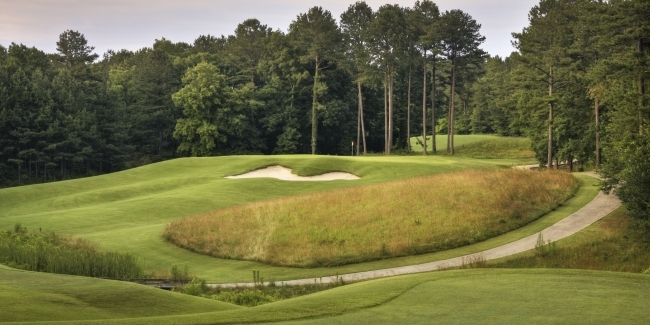 The Hampton Cove facility offers 54-holes of rolling terrain but not as much as Silver Lakes. There are many holes requiring "clubbing up" in order to reach the greens in regulation. We found that the River course features water on 16 of 18 holes and is the only trail course with no bunkers. This particular course is built in the flood plain of the Flint River and was previously a soybean field. The two hardest holes are number 8 and 17. Eight is a par 5, 627 yards from the tips with water on the left side of the fairway from tee to green. Seventeen is a par 4, 421 yarder with a large tree at the tee box and elevated green. The Highlands course is a bit different, in that it is a traditional Scottish-Links design. Holes number 6 and 13 are difficult, both par 4's, long and guarded at the greens with large bunkers. You'll enjoy this course since it not your usual course in these parts of the country. The Short Course is 18 holes of links-like and you are encouraged to alternate your tee positions to give you an opportunity to diversify the course and use every club in your golf bag. It is well to note that water comes into play on 11 of the holes. There is one double green accommodating the 10th and 17th holes. As in many of the RTJ Trail courses, the clubhouse features a full service bar, grill and pro shop. For groups and local clubs, conference space is available. For more information go to: www.rtjgolf.com/hamptoncove. Although our trip did not include the Fighting Joe course at The Robert Trent Jones Golf Trail at Muscle Shoals, it is in the North Alabama area. This is the first Trail course to break 8,000 yards, measuring some 8,072 from the black tees. The second course, The Schoolmaster, opened in 2005. Every hole of this course is in keeping with the natural topography along the Tennessee River, wooded, rolling and spectacular. The RTJ clubhouse features a full-service bar and grill and a pro shop. Meeting and event space is available. Get more information at: www.rtjgolf.com/theshoals. The U.S. Space & Rocket Center houses the National Historic Landmark Saturn V Moon Rocket, the Apollo 16 Command Module, the Pathfinder space shuttle display and many other exhibits. A visit to the North Alabama area is never complete without a visit to the U.S. Space & Rocket Center in Huntsville. Every member of the family will enjoy a trip through its history, exhibits and activities. There are interactive exhibits, rides and hands-on displays tracing our space explorations from the early days to looking toward the future. The Center opened March 17, 1970, as the Alabama Space & Rocket Center. The name change was made in 1989 as a means of connoting a broader audience appeal. Annually, it attracts some 650,000 visitors and is the State's #1 tourist attraction. The facility houses the National Historic Landmark Saturn V Moon Rocket, the Apollo 16 Command Module, the Pathfinder space shuttle display and many other exhibits. The Center is a Smithsonian Affiliate Museum and is the Official Visitor Center for Marshall Space Flight Center. In 1982, Space Camp program was launched. It now boasts of more than 650,000 alumni from around the world, including five astronauts. Aviation Challenge Camp with its leadership and fighter-pilot training opened in 1990 and Space Camp Robotics began in 2013. The North Alabama area presents beautiful scenic mountains, true Southern hospitality, lots of golf courses, State Parks, family attractions and a smorgasbord of foods to satisfy all tastes and types of accommodations. We encourage our readers to consider North Alabama for your next weekend or vacation explorations. Ed has played golf on more than 350 courses in the United States and foreign countries. He loves the sport and enjoys promoting outstanding locations that helps to preserve the game. With over 40 years of experience in the travel and hospitality industry, Stone has a wealth of knowledge and experience in tourism and attraction marketing. He has held director and vice president positions with Callaway Gardens in Pine Mountain, Georgia and Opryland USA in Nashville, Tennessee. For thirteen years he owned his own Marketing & Communications Agency, Stone & Associates in Hendersonville, Tennessee with major regional and national accounts. Ed has major accomplishments in the areas of marketing, research and development planning, advertising, public relations, publicity, sales, television and event production. While vice president of marketing at the Opryland USA complex, he was the executive producer for several major television specials on NBC, ABC, CBS, TNN as well as working on many syndicated television specials. He is a graduate of the University of Georgia's Henry W. Grady School of Journalism with a B.S. degree. Ed is a member of the Society of American Travel Writers (SATW) where he has been honored with Marco Polo status (the highest honored SATW can bestow upon an Associate member) and a trustee for the SATW Foundation.